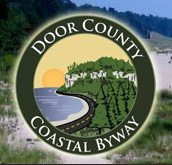 The marker is located adjacent to the parking lot at Dave's Falls Park and is accessible at the westernmost end of County Park Road, west of its intersection with U.S. Route 141, at or near 7894 County Park Road, Amberg, Wisconsin 54102. The marker, visible to the right, is adjacent to the parking lot. The marker is located at Dave's Falls Park. The marker is located in Amberg, Wisconsin.